NOVEMBER 2018 THE SHOP 115 • 104: Electrical and Electronic Systems • 201: Engine Performance and Diag- nostics AXC also offers fee-based adult classes at a very reasonable cost. We spoke to Michael Chiaverini, a stu- dent who, at the time, was well into his second year. "When I started, I knew nothing, had never even touched an engine and now I've done the engine, electrical and I'm on to brakes," Chiaverini said. "It's fascinating and fun and I've learned so much—from what tools to use to how to rebuild an engine. I'd totally recommend AXC." Something really fun at the end of each year is an engine fire-up, where two teams of AXC students fire-up engines they've rebuilt. To make it a little more fun, the engines are tinkered with. For example, plug wires are removed and the teams race to re-fit the wires and get their engine running. They always seem to figure it out and the graduation rate is in the 90- to 100-percent range. INDUSTRY SUPPORT AXC started off reasonably well. The industry was supportive and each of the 50 founding partners had donated $1,000. Then the program really caught fire. 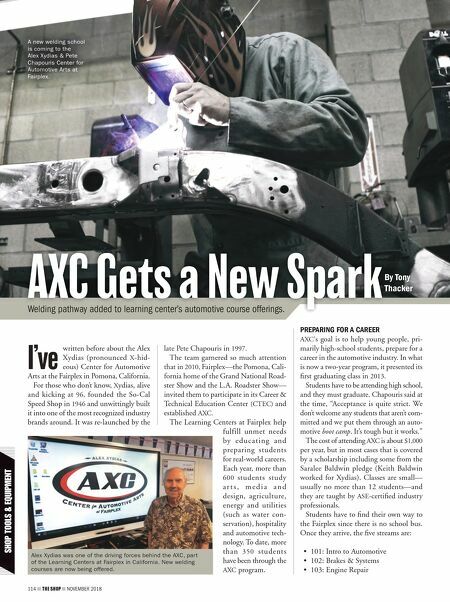 In 2014, the Margie and Robert E. Petersen Foundation donated $500,000 to support AXC and its education efforts. 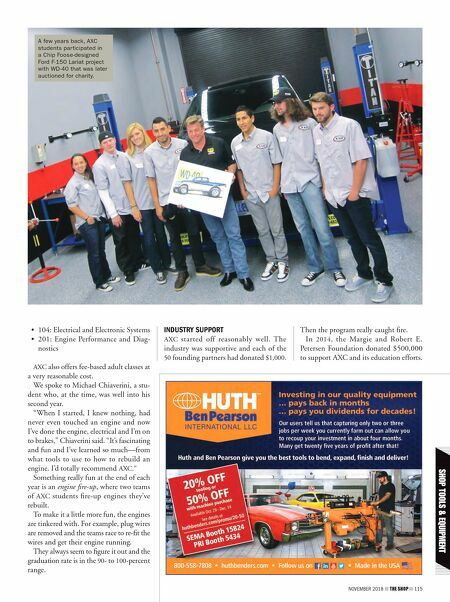 A few years back, AXC students participated in a Chip Foose-designed Ford F-150 Lariat project with WD-40 that was later auctioned for charity.